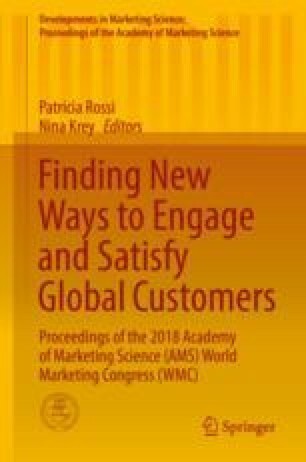 There has been substantial research focused on sustainable advertising (Cummins et al. 2014), communications (White and Simpson 2013), environmental concern (Bhatnagar and McKay-Nesbitt 2016), and intentions and behavior (Kollmuss and Agyeman 2002). It is widely known that shoppers play a role in providing sustainable behaviors and environmental protection (Bhatnagar and McKay-Nesbitt 2016). Additionally, retailers play a major role in environmental sustainability (Green and Peloza 2014; Ku et al. 2012; Leonidou et al. 2011). The present paper examines how retailers can help shoppers make sustainable decisions by communicating with them through their smartphones while they are in the store. According to Grewal, Roggeveen, and Nordfält (2017), one of the emerging ways retailers are facilitating consumer decision-making is through using technologies. Using regulatory focus theory, we argue that sending different messages to shoppers when they are in a choice situation may increase their choice for sustainable alternatives over regular options. Prevention-focused shoppers look to prevention (i.e., the negative effects of not being sustainable), are concerned with preventing problems and losses (Shah et al. 1998), and “proceed cautiously as they pursue goals” (Bhatnagar and McKay-Nesbitt 2016, p. 2). Promotion-focused shoppers are concerned with promoting positive solutions to problems (i.e., positive effects of being sustainable) and trying to achieve those goals (Crowe and Higgins 1997). In an online-based experiment, 147 respondents were exposed to text messages before they had to choose a product. The messages contained either a neutral message, a preventive-focused sustainability message, or a promotion-focused sustainability message. The results show a significant main effect on sustainable shopping behavior. Interestingly, shoppers receiving sustainability messages with a prevention-focused message were the most likely to make a sustainable choice. There were no differences in evaluating the retailer, products, value of the product, or sense of annoyance, indicating that the messages drive sustainable choices while not hurting the retailer in other ways. The results extend regulatory focus theory in a shopping setting and open up for interesting future studies on how to help shoppers make more sustainable choices while keeping retailer perceptions indifferent. In conclusion, technologies used inside stores have a great potential to affect how shoppers behave. In this study, we have shown that by carefully choosing the right focus of the messages conveyed, retailers can make sustainable alternatives more attractive for shoppers without appearing annoying. By using technologies with geo-positioning support, retailers can help the shopper make more sustainable choices and subsequently make shopping a little bit more sustainable.